Not far into her new book, Gao Xingjian’s Post-Exile Plays: Transnationalism and Postdramatic Theatre, Mary Mazzilli laments the lack of attention, outside of certain narrow circles, to Nobel laureate Gao Xingjian. Why do more people not know about this playwright, author, painter, and filmmaker, she wonders? Although Mazzilli does not mobilize the entirety of Gao’s varied artistic oeuvre in making her case, the mere publication of her book serves as an important step in bringing Gao to a wider audience. In a book market that seems to be moving further away from relatively obscure topics like Gao, this is a significant achievement. The book offers in-depth analyses of Gao’s plays written since his self-imposed exile in France in 1987. Although others (myself included) have taken up similar topics, Mazzilli brings Gao’s work into the conversations surrounding narrative and drama today. In short, the book is comprised of deep readings of Gao’s post-exile plays through the framework of Elinor Fuchs’ The Death of Character and Hans-Thies Lehmann’s Postdramatic Theatre. A major goal of the book is to shift the conversation surrounding Gao away from what Mazzilli views as the binary identity politics of East-West and toward “assess[ing] the cultural links of Gao’s theatre with the international theatrical community” (6). She then adds a second ambitious goal: “to consider the term ‘postdramatic’ anew again” (6). The most successful aspect of Mazzilli’s book lies in the assertion and realization of this second goal. Framing Gao’s work within the postdramatic (Lehmann) and post-narrative (Fuchs) discourses is an important step in opening Gao to a wider audience, to say nothing of how it places Mazzilli apart from the extant scholarship on Gao. As Mazzilli employs the concept, “postdramatic theatre” is one in which the relationship and experience between the performer, text, and audience is privileged over the dramatic imperative of dialogue. Importantly, postdramatic theatre is “fluid and avoids prescriptive and contrived aesthetic norms” (12-13). She does not simply rehearse the arguments surrounding Lehmann’s and Fuchs’ work; Mazzilli also offers a new term and framework for our understanding and classification of Gao’s plays: “postdramatic transnationalism.” In her words, “This expression not only refers to a transnational artistic and theatrical trend that is fluid, flexible and accounts for a variety of styles and influences, but also interprets transnationalism by the very nature of a postdramatic discourse” (6-7). Mazzilli spends her first two chapters unpacking this new term and its relevance to Gao’s work. Chapter 1 tackles Fuchs and Lehmann to work through her hybrid theory of postdramatic transnationalism. Mazzilli engages some dense theoretical discourse in her analysis of Gao’s pre-exile play The Other Shore, but manages to express her ideas through practical and intelligible rhetoric. Mazzilli points to The Other Shore as a turning point in Gao’s dramaturgy in that it “moves towards a non-representational kind of theatre by developing abstraction through a disruptive structure”; it is also a play that lends itself to interpretation through a postdramatic lens (21). The Other Shore is a particularly well-chosen text, because it has been anthologized in English translation, and non-specialists are thus more likely to have some familiarity with it. This brings up a particular strength of Mazzilli’s book. Chapters can be studied in isolation for scholars and students looking for close readings of plays and for models of how to engage Sinophone theater using western drama theory. Further enhancing the book’s reader-friendly features is its structure and Mazzilli’s writing style. While the later chapters certainly rely on the work of the earlier ones, Mazzilli’s clearly-argued chapters can be read in isolation and can stand as excellent supplementary material for graduate seminars. Mazilli is meticulous in placing her analysis of Gao’s work in conversation with her readings of Lehmann and Fuchs and alongside contemporary writers, such as Peter Handke, Elfriede Jelenik, and Martin Crimp. She puts Handke and Jelenik together in the rich first chapter and treats Crimp in a separate chapter. I found myself wanting more discussion between the specifics of Jelenik’s dramaturgy and Gao’s opus, not just the transitional play, The Other Shore. Surely, the desire for more is the mark of an engaging argument. Mazzilli’s book takes off in chapter 2 where she treats Crimp and Gao together. She has as much passion for Crimp’s dramaturgy as an exemplar of postdramatic transnationalism as she does for Gao. These opening chapters help to align the reader to Mazzilli’s specific readings of Lehmann and Fuchs and go a long way toward putting Gao’s plays in conversation with contemporary European dramatists. Mazzilli also introduces and expands on her methodology in these chapters. She moves between analyzing the printed text (almost exclusively from Chinese or English translations of French originals) and performances of the text. As a specialist in Performance Studies, I would prefer to see more consideration of the dramatic text in action, which could support Mazzilli’s postdramatic readings of Gao’s plays, but she excels in close readings of the texts and their dramatic potential. That her writing on performances of Gao’s work is somewhat lacking in rigor perhaps reflects the fact that Gao’s plays are not often produced. The remaining chapters take us through a chronological reckoning of other plays by Gao. Chapter 3 takes the reader into a nuanced discussion of Dialogue and Rebuttal, a play written in the early years of Gao’s exile. The chapter puts Gao’s dramaturgy in conversation with Samuel Beckett. Beckett is often invoked in studies on Gao. The two share many dramaturgical characteristics, and Gao has admitted his great admiration of Beckett. Mazzilli focuses on how Beckett, and thus Gao, can be viewed as postdramatic playwrights. Chapter 4 uses Nocturnal Wanderer to explore how politics are expressed in Gao’s plays and more generally in postdramatic works. Mazzilli argues that the political is almost a byproduct of postdramatic aesthetics. She suggests politics are not overt in Gao’s oeuvre, but run beneath the structural elements of his text. In her chapter on Quatre quatuors pour un week-end, Mazzilli references the Chinese/English version of the play using romanized names for the play’s characters. This is where I take some issue with two aspects of Mazzilli’s approach. My comments here are intended as constructive engagement, not as negative critique. I must preface my comments on the first aspect by noting that my work on Gao focuses on his French-language plays; Gao writes both in French and Chinese, but his plays (at least his post-exile plays) are written primarily in French, then rewritten in Chinese, and it is typically these Chinese versions of the plays that are subsequently translated into English. The shifts, overlaps, resonances, transformations, lacunae, etc. between French-Chinese-English are not insignificant. Although Mazilli cites Claire Conceison’s work on Gao’s language, she misses the opportunity to grapple with Gao’s translingualism and to see its potential contribution to her overarching theme of postdramatic transnationalism. Second, in not recognizing Quatre quatuors pour un week-end’s origins in a commission from the National Book Center of France (and production by the Comédie Française), Mazzilli misses an equally important opportunity to consider an explicitly transnational moment in her book’s larger argument. To reiterate, in taking exception with these two aspects of Mazzilli’s interpretation of one of Gao’s French language plays, I am by no means condemning her scholarship or this book. Rather, her arguments (especially her thesis concerning postdramatic transnationalism) are to be commended for drawing the reader’s attention to these issues and stimulating debate. Mazzilli’s work is challenging conventional ideas and is asking those of us who have written on Gao to think anew. In sum, Mary Mazzilli has written an important new book on Gao Xingjian. There are some small editorial oversights, but these do not detract from the clarity of her argument or the success of the book. Mazzilli’s book joins a growing body of scholarship on Gao’s work and its place in world literature. Importantly, it moves away from historical positioning of Gao’s dramaturgy, brings his work into the contemporary moment, expands past discussions of Gao’s identity politics, and places him in a European context. 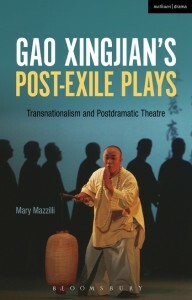 Conceptually, with Gao Xingjian’s Post-Exile Plays: Transnationalism and Postdramatic Theatre and the concept of postdramatic transnationalism, Mazzilli has created a new lens through which to consider dramaturgy and expanded the larger academic conversations surrounding the postdramatic. Todd J. Coulter, Transcultural Aesthetics in the Plays of Gao Xingjian (New York: Palgrave, 2014). In the interest of full disclosure, Mazzilli cites and references my work. See “The Other Side: A Contemporary Drama Without Acts.” Tr. Jo Riley. In An Oxford Anthology of Contemporary Chinese Drama (Hong Kong: Oxford University Press, 2002); and The Other Shore: Plays by Gao Xingjian (Hong Kong: Chinese University of Hong Kong, 2000). Claire Conceison has spearheaded research into the inherent bilingualism of Gao’s plays.